^ Participation of Former Yugoslav States in the United Nations. Max Planck Yearbook of United Nations Law (PDF). : 241–243. （原始内容 (PDF)存档于2010-06-13）. ^ FR Yugoslavia Investment Profile 2001 (PDF). EBRD Country Promotion Programme: 3. （原始内容 (PDF)存档于2011-09-28）. ^ 4.0 4.1 Bosnia: Who Lit the Fire?. YouTube. 2007-11-11 [2010-08-26]. 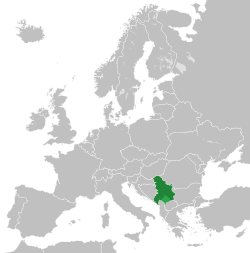 ^ BBC News, 2002.3.14, “Yugoslav partners sign historic deal,” http://news.bbc.co.uk/2/hi/europe/1872070.stm.